This is essentially Large Pearl Tapioca pudding, but in our family it's affectionately known as "Eyeball Pudding." I've taken the recipe from the back of the Island Large Pearl Tapioca box and modified it. I put the tapioca and a cup and a half of milk into a jar and put a lid on it. (I like to drink out of old Frontera Salsa jars -- the tall skinny ones. So we have lots and I just throw the tapioca and milk into one of those.) Let the tapioca sit over night (in the fridge, so the milk doesn't sour). I try to remember to shake it up once in awhile. As it expands it can get jammed into the bottom of the jar and won't soak up the milk like it should. If it doesn't get all jammed, just take a butter knife to it. 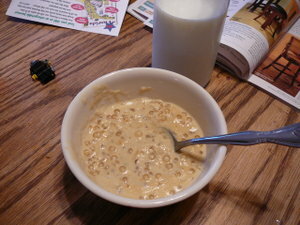 The next day pour the tapioca and milk, and another 3 cups milk, into a sauce pan and heat over a medium flame. Add 2 beaten eggs, the salt and sucanut. Stir until you start to wonder if you're going to spend the rest of your life stirring that confounded mixture. Right when you wonder that (or within a few seconds of wondering it, at least) you'll start to notice that the mixture is thickening. Keep stirring for another few minutes. The pudding will thicken as it cools. Dan's Dad remembers calling it "Fish eyes and glue" when he was younger. yeah, that would probably make more sense. the tapioca is more the size of fish eyes. i wonder if you can buy larger tapioca? the tapioca balls at the bottom of those tea drinks always look bigger than what I end up with in my eyeball pudding. Meg, what is Sucanut? I'm not familiar with it. oops! i spelled it wrong. i couldn't find it the first time round on wikipedia. Sucanat (which is a concatenation of Sugar Cane Natural) is non-refined cane sugar that has not had the molasses removed from it like refined white sugar. It is essentially pure dried sugar cane juice. The juice is extracted by mechanical processes. Oh, I already use natural cane sugar, yay! I thought maybe it was some new natural thing like Stevia, which I haven't tried. http://www.bubbleteasupply.com/store/store.php3?item_id=34 They have colored ones too! http://www.bobateadirect.com/Boba-Tapioca-Pearls-c-1.html Another vendor with all sorts of varieties. I've seen both dry packs and canned boba in the local Asian food store. i've never heard of black tapioca before. i wonder what it is that makes it black. ditto on the colored varieties. food coloring or fruit flavoring? according to an un-cited line in wikipedia: "During World War II's Japanese occupation of Southeast Asia, many refugees survived on tapioca." Now I'm curious to know what nutritional value it has. Hmmm. in 1972, a ship was almost sunk when a fire on board (and the water used to put it out) cooked the tapioca in a lower hold. the mass expanded and threatened to buckle the steel plating. looks like there's no vitamins to speak of. 18 mg of potassium in a 3 oz. serving. (who can eat only 3 oz!) 4 mg iron. 18 mg phosphorus. (what does phosphorus do? i mean, what is it good for?) 0.1 g fiber. (i like how it's only a decimal amount but they still stuck it in there. cute.) 0.2 g fat. 0.6 g protein. 352 calories. (dang, that's a lot for something that's measly on nutritional content. it must be because...) 86.4 g carbohydrates. And yet the link you point to shows the pearls being black. i wonder what it is that makes it black. ditto on the colored varieties. food coloring or fruit flavoring?According to http://www.bubbleteasupply.com/index.php?page=what.html...Tapioca pearls are black, but can sometimes be found to be white or transparent. Depending on the ingredients of the pearl, the color varies. I've been told that the white and translucent pearls are made of caramel, starch and chamomile root extract. The black pearl includes sweet potato, cassava root and brown sugar, which add the black color. Actually, the picture of the outside of cassava root itself at http://en.wikipedia.org/wiki/Cassava looks much closer to the dried packaged uncooked "black" pearls than the white ones, and the article says that the material "darkens quickly upon exposure to the air". So it could be that the black ones also weren't peeled first or were sloppily processed in air rather than under water. As for nutrition, the article claims, "Cassava roots are very rich in starch, and contain significant amounts of calcium (50 mg/100g), phosphorus (40 mg/100g) and vitamin C (25 mg/100g)."